2435 Longview Drive is located in the west area of Bishop, off of Barlow Lane. This friendly neighborhood is just outside the city limits, and you will often see your neighbors out walking with their families and pets. Property details for 2435 Longview Drive, Bishop California. This mid-century modern home offers 3 bedrooms, 2 bathrooms and an open beam ceiling throughout. This home offers wood laminate flooring in the main living areas, with carpet in all of the bedrooms. The sun room located on the North side of the home, offering large windows, sitting areas; and looks out into the backyard. A large two car attached garage offers a stand up attic storage area, which could be easily updated to an extra bedroom or office. 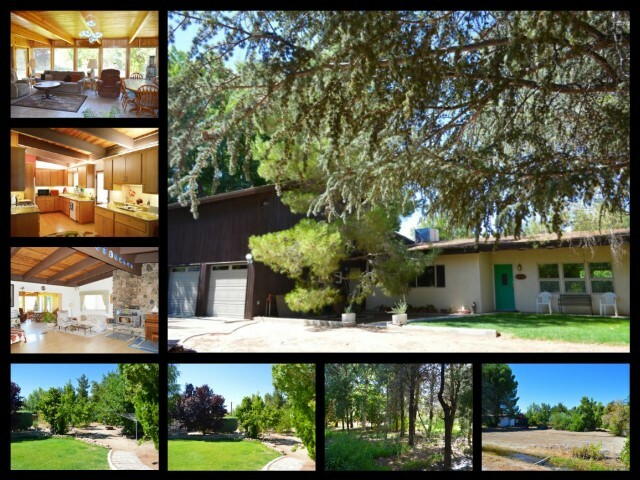 The home sits on one of the larger lots for the area having 1.42 acres, and zoned for horses. The front of the property there is a tranquil seasonal creek and pond that is visited by ducks and other flying wildlife. Behind the home there is a freestanding workshop building, and room to park RV or toys. Trees are located around the property that offers shade and beauty. The back part of the property offers a fairy like atmosphere, perfect for kids or your own private escape.